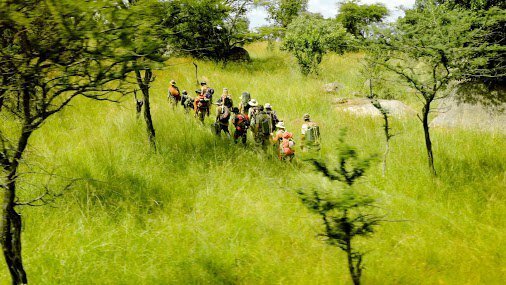 In the National Geographic Channel show Mygrations a human herd of 20 elite survivalists follow the wildebeest migration across the Serengeti. Along the way they encounter some of the most extreme dangers ever put before reality television participants. Faced with lions, crocodiles and hippos the dangers seem very real. One night they are awakened by a pride of lions in the tall grass. They cross two rivers on foot that are teaming with crocs and hippos. Each night they keep a fire burning and at least two people stand watch. And all of this meanwhile as they are virtually starving. For Jens Rasmussen, one of the show’s participants, the experience amounted to an adventure of a lifetime. Absent are the big money prizes — though they were each paid — or head-to-head competition. Given the life threatening dangers around every corner, we wanted to know why do it. One of my first questions when I reached him over the phone recently was about how much protection they actually had. He said there was usually a film crew with them through the night, which typically leapfrogged over them during the day. But even with some level of protection, Rasmussen said the dangers were still real. In the episode, one woman suggests they spread out so that if someone gets hit by lightning the others can administer CPR. It might not have been exactly what Rasmussen had signed up for, but an experience he said was well worth it. Unlike other reality shows that field hundreds of submissions, Rasmussen and most of the others were recruited by the show’s producers. Having grown up in a Scandinavian family in rural Wisconsin, he learned basic wilderness survival and how to be comfortable in the woods from a young age. Later he said he learned bushcraft skills at Jack Mountain Bushcraft School in Maine run by Tim Smith. After moving to New York City to follow acting, Rasmussen started the North Brooklyn Boat Club located under a bridge in an abandoned industrial lot among a Superfund site. From there he led boat trips and later taught wilderness skills like fire making, which caught the attention of the New York Times and led to a call from a production company in London. You can currently see Rasmussen in the play Seen by Everyone. LO: I know that you guys were sticking with primitive foods and ways of travel. But was there anyone in the production crew who had a fire arm? Rasmussen: There were security measures, but when you’re dealing with a pride of 20 lions, you never know. What we had faith in was the aboriginal wisdom, the native wisdom, that you do not sleep in that part of the world without a fire. The Hadza have fires at the doorway of every hut that they have people sleeping in. Then they have bigger fires in the middle of the camp. On that night when the pride came in, we made multiple fires. We had the central fire and then little fires outside the perimeter. LO: It struck me watching you all walk across a big open plain in a human herd that animals have been travelling this way and bunching up in herds to protect themselves, but obviously not entirely successfully. Someone is bound to get picked off. Did you worry about that? 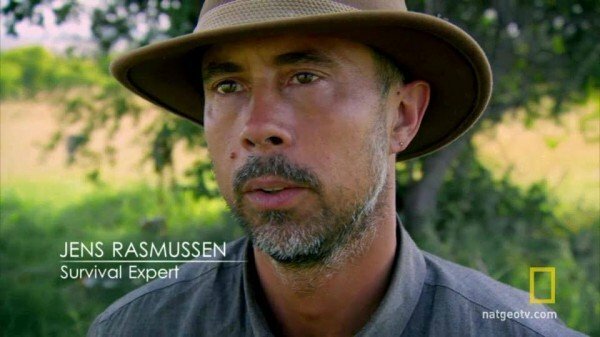 Rasmussen: The advantage we have as a species, what got us as far as we have is our control of fire. None of the species, except maybe crocodiles, won’t hunt humans. They might prey on you because they are scared but they won’t hunt you. Crocs are different. They’ll learn the pattern if you gather water from the same place. Whereas if you make yourself known to lions they’ll stay the hell away. LO: What was the toughest part? Rasmussen: One thing I don’t think the show captures yet is the sort of severe starvation we went through. The hunger goes away, it’s the starvation you feel. It’s the most profound exhaustion you’ve ever experienced. Everyone is dealing with bouts of dizziness and near fainting, problems with equilibrium. Coordination is going. Literally when we got into camp we needed to start gathering firewood and the level of exhaustion was so bad that we’d get a piece of firewood and you’d have to rest. It’s profound. I would say that was one of the gifts of the experience. LO: Do you think that changes your perspective on things? Rasmussen: Oh yea absolutely. I don’t know if I could have done that to myself. I don’t know if I would have had the discipline to give myself that experience. It makes me appreciate where I was born, the immense abundance we have in this culture. next articleIs Subwing the Coolest Thing Ever or an Accident Waiting to Happen?